The "Must Have" Accessory for Your Beach Bag or Large Glitter Tote! Perfect size to carry all your toiletry items in OR your "Wet Stuff" or "Dry Stuff" at the pool! Our #1 Selling Size of Cosmetic Bags. 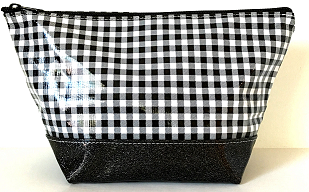 Same size as the Large Cosmetic Bag, only with a sparkly GLITTER Vinyl Bottom! 12" l x 7.5" t 7.5" l x 4.25" w at bottom All Cosmetic Bags are lined with our choice of coordinating oilcloth to make clean up a breeze! Glitter Bottom Options are: Black, Red, Burnt Orange, Kelly Green, Royal Blue, or Bright Purple Monogram can be a name or initial(s).